Texas Trail Roundup is starting a NEW Special Program in January, 2018. Tails on the Trails is for people who walk with dogs. To earn the patch, the human needs to complete 20 walks with a dog. You can repeat a walk up to four times. The book has been approved by AVA for the use of the IVV certification stamp, but is it not an AVA special program. NOTE WELL: It is against IVV rules to give credit to non-humans. This book CANNOT be issued in the name of a dog. It must be issued in the name of a human. YOU are earning the credit for walking the dog. Books cost $10 and can be ordered from Susan Ives, Texas Trail Roundup, 3614 Pinebluff, San Antonio, TX 78230. Make checks payable to TTR. Call her at 210-325-3498 or e-mail suives@texas.net if you have any questions. Once you’ve completed your 20 walks, mail the book back to Susan and you will get the patch mailed to you. We’ll also have the books for sale at many local San Antonio-area walks. The program begins on 1 January, 2018 and books will be sold through 31 December, 2020. You may complete walks though 31 December, 2021. You do not have to walk with the same dog every time (there’s a small space in the book to annotate the name of your canine companion(s) if you wish) and it doesn’t have to be YOUR dog. If you accompany a dog walking friend on an entire walk, you can count that. And since we’ve been asked — yes, it does have to be a REAL dog. Stuffed toy dogs do not count. We do not have a patch for cat walkers, ferret walkers, gerbil walkers or giraffe walkers, but if you manage to walk 20 AVA sanctioned walks with a cat on a leash we’ll consider designing a special patch just for you. The button: We had 150 3″ buttons made that promote AVA as America’s DOG Walking Club. Sorry — these are too bulky and expensive to mail, but we’ll have them at TTR and other local events and give you one for free if you show up with your pup. Wear it when you’re out walking your dog as a way of initiating a conversation about AVA with other dog walkers you may encounter on the trails. The Business Card:We ordered 500 business cards. If you order a book, we’ll throw a few in the envelope so you have a reminder to hand to other dog walkers you meet on the trail. If you’ve got a great photo you you and your dog on the trail, e-mail it to suives@texas.net or text it to 210-325-3498. Be sure to include your name, your dog(s) name, the name of your club and the location of the walk. 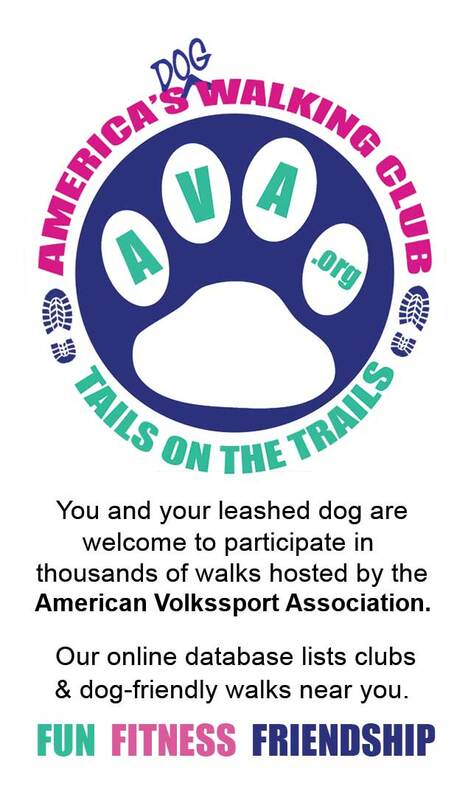 We’ll insert a photo slider on this page to celebrate all of the AVA dog walkers!